One of the most popular slogans of India’s Right to Food Campaign is “Hungry stomachs and overflowing granaries, is injustice; is a crime!” Right through the period of almost eight per cent economic growth, India has ranked around 67th out of 88 countries on the global hunger index prepared by the International Food Policy Research Institute. Yesterday the upper house of the Indian Parliament passed a legislation attempting to address the nation’s distressing and iniquitous situation of hunger among plenty. When the second most populous nation in the world, with the largest absolute numbers of hungry people, malnourished children, and vulnerable elderly, passes what it calls a ”National Food Security Act”, the whole world should and must sit up and take notice. The truth, however, is that this legislation is grand in name, and modest in content. It certainly does not guarantee ‘food security’ to all Indians. Nevertheless, in scale if nothing else, it is one of the most ambitious state driven efforts to address food and nutrition related vulnerabilities, in what is essentially a “market driven” economy. It is a limited, but extremely significant step towards the state taking legal responsibility for better distributing the food that is produced, procured, and stored in the country. The “Food Security” Act is a bit of a misnomer. It is in fact a food grain entitlements act that guarantees five kilograms of food grain a month, at Rs 2 (under four cents) a kilogram to almost a billion people – or about 67 per cent of the Indian population. It also seeks to provide nutritional and food inputs to all children up to the age of 14, and food and maternity benefits to pregnant mothers. It is estimated to cost about $25 Billion a year (about one per cent of GDP), and require the procurement of about 62 million tonnes of food grain annually. It is estimated that it would meet about half the food grain needs of the benefited families. In poorer parts of the country it would cover almost the entire rural population. There is an interesting irony in the commentaries and reactions to this Bill. Questions are immediately being asked whether India can afford it, and can deliver even the limited entitlement the law offers. India’s ‘pink papers’ and market economists are painting doomsday scenarios about spiralling costs, and a potentially disastrous effect on the Indian economy. In fact, if the English language media read and watched by India’s elite were to be believed, India’s rising inflation, and falling growth rates can already be attributed to a Bill that is still to come into effect! It is reminiscent of the assertions that were made at the time of the passage of the National Rural Employment Guarantee Act in 2005. Eight years later, with expenses not reaching anywhere near those predicted levels, and evidence of the MGNREGA actually strengthening local economies, these analysts should have lost voice and credibility. However, the ruling elites’ desperation to control even state resources and corner it for the private and privileged sector, has led them to express distress over almost every rights based legislation passed over the last eight years. Opposition to the Food Rights Act has been backed by sections of the ruling alliance, and opposition parties, who have tried every diversionary means to block passage of this law. What has finally tipped the scales is the fact that politicians have to contend with an electorate that has watched the rich benefit from years of eight per cent growth, while millions of others are still wondering about their next meal. The need for food security in India is tangible, and immediate. That is why the bulk of the amendments moved by the opposition parties in Parliament were to strengthen the Bill and extend its scope. The ease with which the Bill was passed when put to vote, indicated that it was not just the ruling alliance that knew that a general election was round the corner. It is clear that the poor in India have to thank democracy and elections for attempting to deliver what the market can’t and won’t – no matter how basic, and legitimate the demand might be. This legislation, its history, and its mechanics need to be better understood to go beyond the rhetoric. There can be little doubt that this Bill owes its existence to many factors including the mounting and even rotting food grain stocks that the government procured. The procurement takes place under an existing protective system offering farmers a minimum remunerative price for their produce. As a result, India today has over 80 million tonnes of food grains stocked inside (and lying outside in the open) government granaries, with no more place to store it, and inefficient and insufficient ways to distribute it. The existing food procurement and distribution systems are already required to procure about 60 million tonnes of food grain annually at an expenditure of about $20 billion. This Bill has marginally increased the procurement requirement to about 63 million tonnes, and increased the costs by 20 per cent to $25 billion per year due to reduced prices and greatly increased coverage. In terms of the GDP, costs would go up from about 0.8 per cent to about one per cent of GDP. What then does this Bill seek to do? It seeks to add a little to gain a lot: It acknowledges the prevalence of hunger and widespread malnutrition, accepts some of the demands of right to food activists, and learns some lessons from states that have turned their PDS into efficient and viable systems. The States showed political will by using meagre state resources to enhance food grain being provided by the centre to provide significantly larger numbers of people with significantly cheaper food grain. In essence, they increased coverage towards universal entitlements, and made the food grain so cheap that everyone had a significant stake in fighting to get their entitlement. Some states put in place robust transparency and accountability provisions, increased local procurement and storage, and took firm and exemplary action against those who violated the provisions of the scheme. Opposition parties have been accusing the central government at trying to win the election through this. They should know, because their parties who head different state governments have won, in no small part because of their ability to deliver subsidised food grain to larger numbers of people. In many of its other provisions, this bill only provides legislative sanctity to what has already come into existence through existing schemes and Apex court orders. 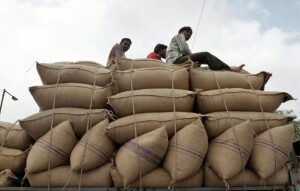 In a series of orders in what is called the Right to Food Case, the Supreme Court of India, sought to find ways to put to use idle stockpiles of food grain, by ordering the implementation of a nationwide mid day meal scheme that caters to over 100 million school children, and an enhanced pre-school crèche and nutrition programme. There is little argument that those schemes need to be strengthened in terms of both outlay, and delivery. The Bill could provide a platform to convert these into effective and robust entitlements thereby changing the reprehensible statistic of 45 per cent malnutrition among India’s children, which the prime minister of India quite rightly called a national shame. There are a few more important provisions, like six month income supplements for pregnant mothers, and the right to a cooked meal in the nearest crèche. There are also many glaring and inexplicable omissions, like community kitchens for the destitute despite not requiring much additional money. The grievance redress system is remote, and ineffective. It is a blunder to pay it such scant attention, because it would have required a very low financial outlay, and would have made every rupee go further. The greatest potential that this Act offers is a framework to build upon the basics, and carry it forward into a crucial enabling mechanism to fight hunger and starvation. If states were to enhance the central outlays with state contributions, they could make the scheme far more viable, and with political will, and proper delivery it could even pay rich political dividends. The third and the fourth schedule of the act contain aspirational aspects like increased agricultural production, local procurement, provision of lentils and oil, and social security pensions. It is in the converting of those aspirations to reality, that the Food Security Act could do what it claims to be, and prove to be an inspiration to the entire world. Nikhil Dey is a social activist who has helped draft the historic Right to Information and Employment Guarantee Bills in India. Nikhil currently works with the Mazdoor Kisan Shakti Sangathan (MKSS), a peasant and workers organisation in the western Indian state of Rajasthan. He is also a member of the Central Employment Guarantee Council (CEGC) and a co-convener of the National Campaign for People’s Right to Information (NCPRI).